What better way is there to celebrate spring, than to invite friends and family over to enjoy a delicious meal in good company? We've rounded up our favorite spring brunch recipes that feature seasonal ingredients and great flavors. They are special enough for Easter lunch, book club meetings, or whenever you host guests for brunch this season. 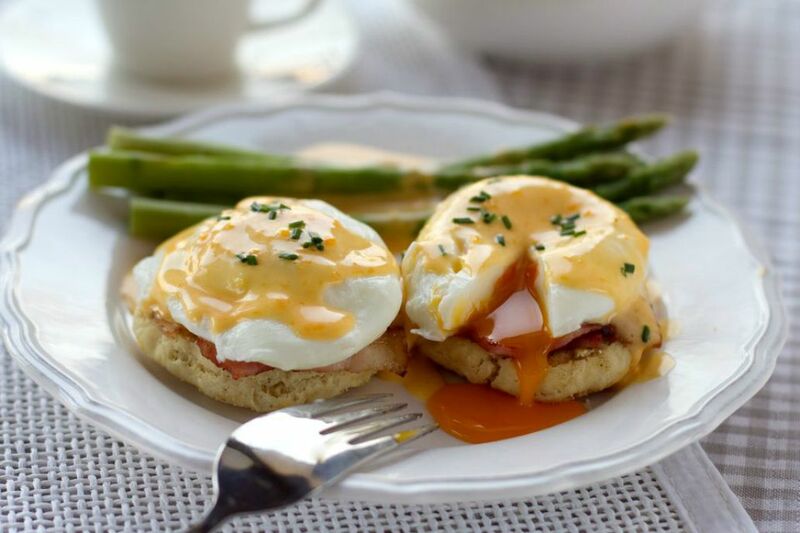 Serve classic eggs Benedict when you want to impress brunch guests. Perfectly poached eggs, salty Canadian bacon or ham, and warm, creamy hollandaise sauce are ladled over toasted and buttered English muffins, for the ultimate combination of breakfast ingredients. Brunch guests will go bananas for this rich and filling French toast casserole you can make the night before. Cubes of egg-soaked bread, sliced bananas, homemade caramel sauce, whipped cream, and optional rum make this indulgent overnight breakfast dish a real knockout. In less than an hour, you can prepare and serve a homemade, eggy Italian-style frittata to brunch guests. Shredded potatoes give this dish great body, with mild spring leeks and fresh snipped herbs adding fresh, vibrant spring tastes. Fluffy orange buttermilk pancakes infused with lively citrus flavor from orange juice and zest are a refreshing variation on the usual pancakes. Serve them with sausages or bacon, and some fresh sliced fruit, for a complete brunch plate. Treat your brunch guests to a restaurant-style dish, with this amazingly easy recipe for perfectly creamy scrambled eggs, with soft and salty chunks of delicious smoked salmon. Serve piled high on buttered brioche toast, or with your favorite sweet breakfast rolls. These yummy Southern-style breakfast waffles have a light and fluffy texture, with a surprising crunch from pecan pieces in the batter. Dress them up to your tastes, with the great ideas and tips for variations in the recipe. Soft butter lettuce leaves and bright, thinly-sliced raw asparagus are dressed in a light and zesty vinaigrette, and topped with crunchy pistachio nuts and creamy fresh mozzarella balls, in this elegant brunch salad recipe. Eggs Florentine is similar to brunch favorite eggs Benedict, but omits the ham, adding lightly wilted fresh spinach greens instead. They sit upon toasted English muffins, along with lightly poached eggs and a simple, buttery hollandaise sauce. Treat guests to a French bistro-style brunch, with this classic recipe. Use an eggy bread, such as brioche or challah, for this delicious grilled cheese toastie that features a perfectly fried egg, melted Gruyere cheese, and a topping of bechamel sauce. Pain perdu (literally "lost bread") is a yummy variation on French toast that originated in New Orleans, as a way to use up leftover bread. Thick baguette slices are soaked in a cinnamon-spiced egg batter, lightly browned in a skillet, and then baked to perfection. Serve topped with maple syrup, or a sprinkle of powdered sugar and fresh fruit. Light and fluffy ricotta breakfast muffins are studded with roasted strawberry chunks, for a special treat that will wow guests at brunch, or at bridal and baby showers. Serve while still warm from the oven, or freeze up to 3 months for enjoying later. Avocado and poached egg toast is an easy recipe that combines your favorite morning foods. You can skip the hot sauce in this recipe if you don't like spice, substituting a drizzle of fresh lemon juice and a sprinkle of salt instead, to wake up the avocado. Egg and butter-rich brioche bread elevate this home-style bread pudding recipe that makes a wonderful brunch dessert. The bread cubes are soaked in a simple, lightly spiced homemade custard, with optional brandy for a touch of decadence. Serve topped with whipped cream. Quiche is always welcome at brunch, and this one gets plenty of flavor from savory mushrooms. seasonal green asparagus, and juicy tomatoes. Bake it in a prepared pastry shell, and plate with lightly dressed salad greens for an elegant mid-day main course. Shirred eggs are baked in the oven in individual ramekins, with a drizzle of heavy cream, and a little melted cheddar, for a simple and cheesy egg dish with an elegant presentation. Serve atop a pile of dressed salad greens, or alongside bacon or sausage and fresh fruit. Traditional British scones are often served at afternoon tea, and make a fabulous last-minute brunch addition, served with plenty of butter and jam, or heavy cream, for topping. The yeast-free dough is simple to prepare and bakes in your oven in only 15 minutes. Fluffy homemade pancakes with all the flavor and spice of carrot cake — including heavenly cream cheese icing on top — are a sweet way to celebrate spring. Add some chopped pecans to the batter for crunch if you like, and serve these flapjacks for an indulgent weekend breakfast, or Easter brunch. Shakshuka is a traditional Middle Eastern breakfast dish with poached eggs cooked in a sauce. This super-nutritious version is packed with leafy greens, cooked in a creamy, cumin-spiked sauce, with perfectly poached eggs nestled on top.